Get your Wodka Gorbechow ready, this episode, Bother’s Bar ONCE AGAIN brings you Only Connect‘s David J Bodycombe, Daniel Peake and Lewis Murphy from Fifty 50 and myself guiding you through the evening’s Schlag den Raab – LIVE! Come back here at 7ish for a link to our live stream. We’re hoping to go on through until the close of play which could be any time between 11pm (if it’s a whitewash) and 2am (if it goes to the wire). Even if you can’t join us for the entirety of it, just tune in when you want! And we want you to get involved! Your best way is either opening up the stream in a new window and making YouTube comments or tweeting with the hashtag #bbsdr. We’ll read out the most worthwhile ones. And some of the not-so-worthwhile ones. And we’ll be doing it LIVE. Whatsmore this episode we are doing a competition! You need to predict who will win and what time the confetti will go off according to my watch. If you’re correct with the winner and closest to the time you’ll win €35. If you’re closest and within five minutes, you’ll win €100! Congratulations to Caroline whose guess of the Contestant winning at 23:45 wins €35! Stefan Raab has won the last six episodes, so tonight there’s an eye watering €3.5m on the line for one lucky contestant which if it gets won will be, we believe, the biggest post-tax haul taken away from a gameshow worldwide. The musical guests tonight are Taylor Swift, Seeed and Deichkind. I know! Deichkind! If you’re new to Schlag den Raab then welcome! I’ve included a basic FAQ under the cut. What is Schlag den Raab? Schlag den Raab (Beat Raab!) 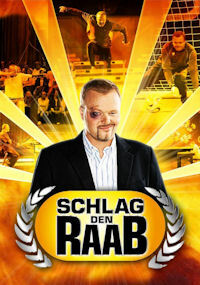 is a German TV show on six times a year where members of the public take on TV personality Stefan Raab in a series of games for a lifechanging cash prize – €500,000. If Raab wins, the money rolls over. The action is broken up by musical guests. Part Jonathan Ross, part Simon Cowell, Stefan Raab is one of Germany’s most popular TV personalities. The show he is probably most famous for is weekly chat show TV Total, but elements of this have spun off into their own shows – annual wok racing championships (it’s going down a bobsled run on a wok), celebrity diving, celebrity stock cars… all sorts of things. He’s also a song writer who has competed in the Eurovision Song Contest and runs the German Song Contest. It was a Stefan Raab show that found Lena, of Satellite fame. And he’s competitive, very competitive. Five contestants limber up and the public decides who will be the evening’s challenger through a live telephone vote. Contestant chosen, they will face-off against Raab in up to fifteen games – the first game is worth 1pt, the 2nd two all the way up to game 15 worth 15 points. With 120 points on offer, the winner is the first player to reach 61 points. At least 11 games have to be played (that will get you 66 points, and yes there have been 66-0 shutouts) but with the big points towards the end you’re rarely out of contention. Three or four rounds are likely to be quiz rounds. The formats differ each time. You can guarantee Blamerien oder Kassieren will turn up starring Raab’s TV Total colleague Elton (this is a quiz they play on TV Total). There is usually some sort of driving event, usually in the form of a time trial. There will be three or four events based around sports, sometimes straight but usually a variation of something known. There’s usually some sort of strategy game. Almost certainly a hard test of mental agility and memory. The rest defy pigeonholing and are often wildly inventive. You’ll just have to watch and see! Isn’t this just Beat the Star with Vernon Kay? This is the show Beat the Star was based on. The main differences are it’s the same opponent each episode, the games tend to go on a bit longer, and the show can be on for five to seven hours. And it’s all completely LIVE. The legend has it (i.e. we read somehwere) Raab invited a female boxer onto TV Total, and then joked that she couldn’t hurt him. She gave him a black eye. A format was born. Next show is 12th January. I think with Raab’s involvement in Germany’s Eurovision entry over, the pattern will go back to January/April/May/September/November/December. If “the biggest post-tax haul” means you think he has to pay taxes (I just can’t translate it), them you are wrong, he is even luckier: You DON’T have to pay taxes in Germany when you win something on a game show, unless you appear on more than two episodes (Big Brother for example). Bernd actually is 3.500.000€ richer! ! ! We know cash prizes in Germany are tax free. When we mean by “the biggest post-tax haul” it’s because some large prizes won around the world has to be deducted for tax. For example, Ken Jennings won $2,522,700 on Jeopardy! but that wasn’t the amount he walked home with. More relevant to our claim, there was a 10 million gilder winner on Miljoenenjacht, which equates to somewhere in the region of 4.25 million euro – but that was taxed at 25%, so this amounts to less than Bernd’s win last night after tax. Your comment reminded me of “Die 10 Millionen Mark Show”/ “Die 5 Millionen Euro Show”, in which (surprisingly) 10 Mio. DM/ 5 Mio. € were won. This show was some sort of an event with just few episodes a year and sponsored by a German lottery. They canceled it when advertisements for lottery on television were forbidden. They continued with doing it, but without anyone noticing it still existed. There you’ll find some information: http://de.wikipedia.org/wiki/Die_5-Millionen-SKL-Show Unfortunately this article doesn’t tell how many people have won the money. But about 7 people could have won it, I think. What does that bit about the court case say? It seems to suggest the lottery continued to advertise the show using his likeness even though he’d left the programme? It says a decision was due in March last year but nothing more has been added to the article. Although interestingly SdR outrated Talent in the 18-49 demo. And I think that Bernd goes to #2 behind the aforementioned Miljoenenjacht winner (Arno Woesthoff) in the pre-tax list too. Bernd Stadelmann is his full name, for the benefit of people collating records in the future.